Download a Bank of America Direct Deposit Form, also known as a Non-Federal Direct Deposit Enrollment Request Form. 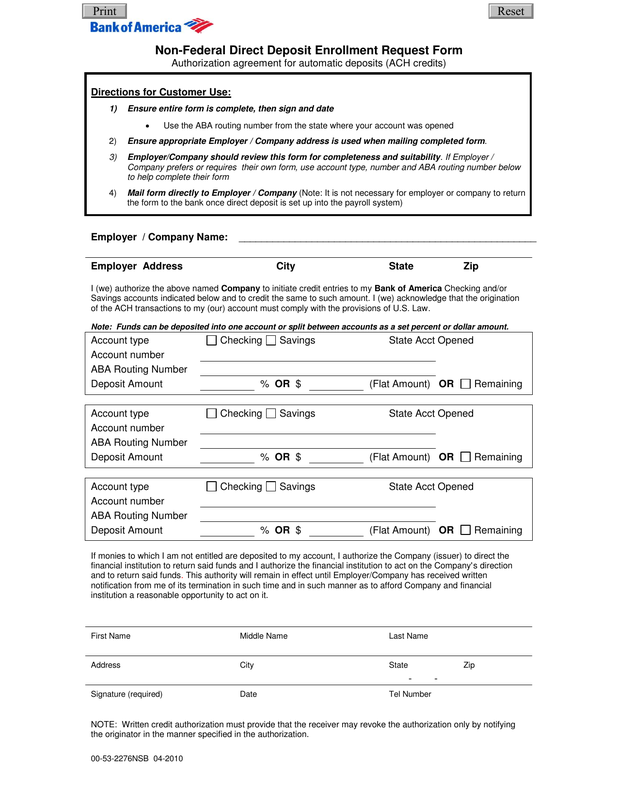 This is an authorization form, for Bank of America, to allow an employer to pay employees with direct deposits or ACH credits to be placed into a Bank of America customer account. This is a process that benefits both the employer and employee by, bypassing a paper check and placing funds owed by the employer directly into the employee account electronically. If you would like payments split beyond one account, simply complete the other(s) and specify amounts. If monies to which I am not entitled are deposited to my account, I authorize the Company (issuer) to direct the financial institution to return said funds and I authorize the financial institution to act on the Company’s direction and to return said funds. This authority will remain in effect until Employer/Company has received written notification from me of its termination in such time and in such manner as to afford Company and financial institution a reasonable opportunity to act on it.